The Dow Jones Industrial Average, commonly known as the Dow Jones or simply the Dow, is a stock price index based on thirty prominent stocks on the New York Stock Exchange. The DJIA can be traded under the stock symbol DIA. The other two major indexes are the "S&P500" (which can be traded under the symbol "SPY") and "NASDAQ" (the trading symbol "QQQ" somewhat tracks that index). The Dow Jones Industrial Average is the average of these thirty stocks, and is a commonly used indicator of general trends in the prices of stocks and bonds in the United States. The Dow Jones Industrial Average was first published by Wall Street Journal editor Charles Dow in 1896 with twelve stocks. The only stock of the original twelve that is still a part of the Average is General Electric. Unlike other indexes, the stocks in the Dow are weighted according to the price of one share of each company's stock, rather than by its market capitalization (overall company value). Thus the higher the stock price, the greater weight it has in the Dow. This tends to eliminate companies maintaining high prices for their shares, such as Amazon and Google, from being considered for inclusion in the Dow. The last time the Dow changed its component stocks was in March 2015, The last time the Dow changed its component stocks was in June 2018, when it replaced General Electric with Walgreens. The prior substitution was in March 2015 by the Dow, when it replaced AT&T (T) with Apple (AAPL). Due to the erosion of manufacturing jobs in the United States resultant from harmful free trade policies, the Dow is not really "industrial" any more. 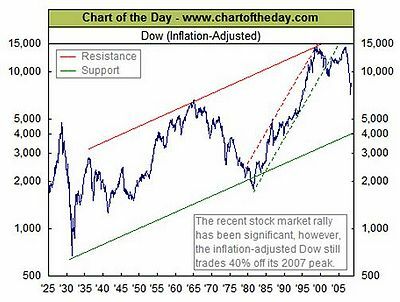 The Ins and Outs of the Dow Jones Industrial Average. The Wall Street Journal. Retrieved January 25, 2017. This page was last modified on 26 September 2018, at 10:27. This page has been accessed 15,740 times.